Every single year I say I’m NOT going to go all out on my fall porch decor. Every. Single. Year. And then I get started with creating a simple fall planter. Then add a few simple mums here and there. Maybe a simple bushel basket or two. And next thing you know, I’m rummaging all over my house for just one more thing to put on my porch to make it just so. 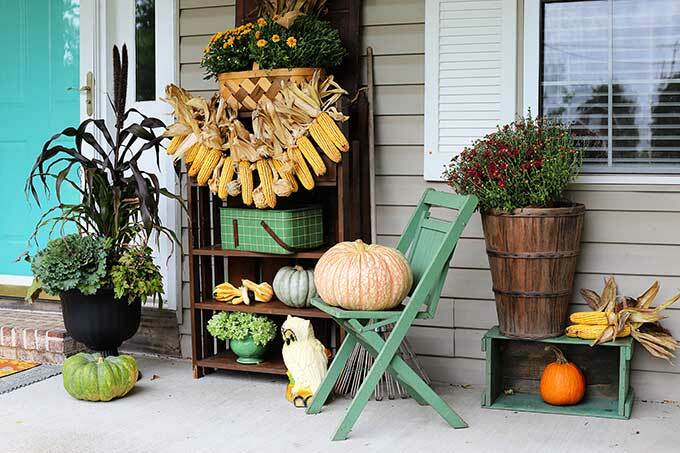 And all my ideas for a simple fall porch go flying out the window. But this year, I think I’ve contained myself. It’s not an over the top, fall threw up on her house kind of porch. 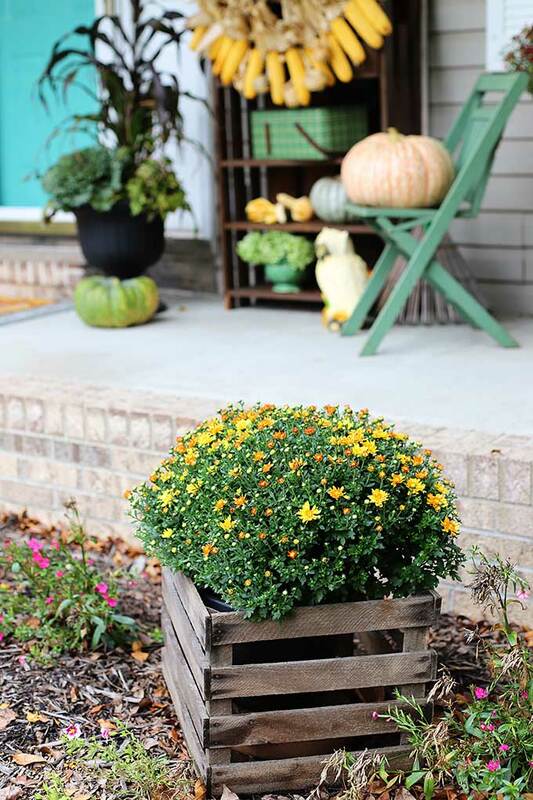 And I did not decorate the WHOLE porch, so if you need ideas for small front porch decor you could easily remove one planter and the chair and you’re all set. Unless of course you have just a stoop and then I feel for you, because I was a just-a-stoop homeowner prior to this house and I get the challenge, Sister! My whole porch started when I found this shelf made out of fence pickets at a local shop. It was old and crusty (with who knows what, but it may have been chicken poo), had been found in a barn (again, chicken poo?) and it was just setting there all lonely waiting for someone with $10 in hand to rescue her ($10 chicken poo?). I was happy to oblige. The poor petite high school girls who were helping out at the shop that day probably regretted asking me if I needed help loading it in my van, because this sucker is so much heavier than it looks. Like 80 pounds of heavy. These kinds of shelves are sort of common. I think they must have been a project in a woodworking magazine back in the day, because I see them at estate sales and barn sales quite a bit. I had thought about painting it burgundy or mustard yellow to be a bit more festive. But then the basic brown started growing on me. Brown is perfect for fall. And I didn’t have to lug the thing back off the porch to paint it. So brown it stayed! I did wipe the chicken poo off it though, just in case you can’t get chickens squatting on this shelf out of your mind. So with my fall foliage planters that I showed you how to make the other day and a brown shelf, I just started adding things I already had around the garage and basement. I rarely, if ever, buy anything new for my porch decor. I try to use what I have. Basically, because it’s a porch and not my living room and it is going to get rained on, snowed on (please, no time soon) and things may even get blown around a bit. I’ve rescued the cornstalks and the bushel basket full of pinkish mums from the hydrangea bushes once or twice already. All to say, let’s not spend money on something that it so going to set outside in the elements and will probably only last a year when there are much better things to spend our hard earned bucks on. OK, did you know this was a “thing”? You take a door mat and use a throw rug underneath it to sort of beef up the doormat. I’ve seen it on a few other blogs and I was all like “Hey, I want in on that action!”. Well, trying to find a throw rug that matches your existing orange doormat is not all that easy. 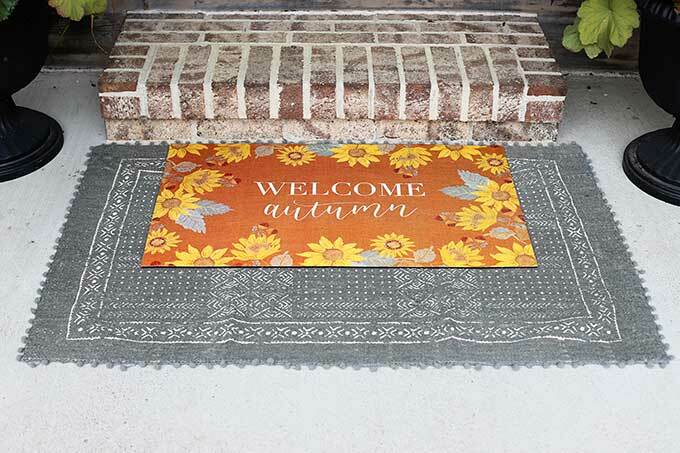 I decided to go with this gray, slightly over-dyed global inspired rug because the doormat has a tiny little bit of gray in the leaves. Get it, leaves – growing. I guess if I have to spell it out even to myself I need to up my pun game. 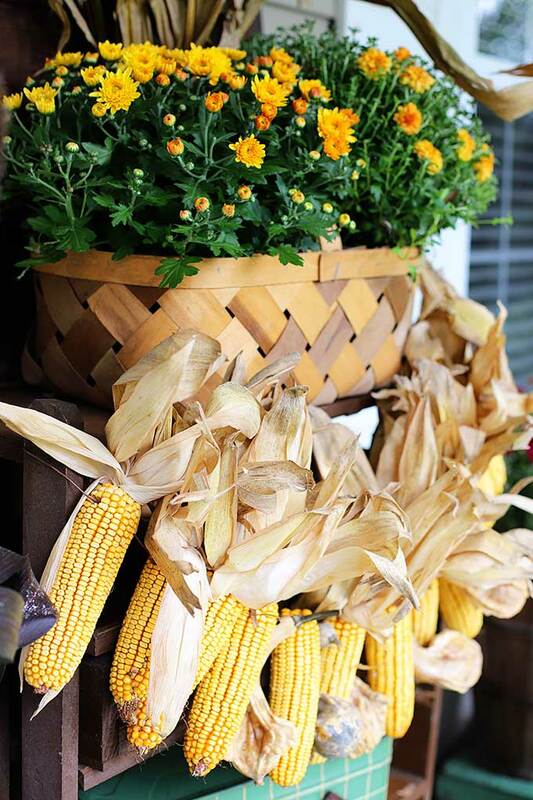 My hands down favorite thing on the porch is this corn garland that I bought at the Country Living Fair. I L-O-V-E it to death, but on the ride home I realized that I have a whole cornfield surrounding my house and some gourds setting on my kitchen table, so I could have made one in about ten minutes. You live, you learn, you make it yourself next year! UPDATE: I did a tutorial on how to make one for you. 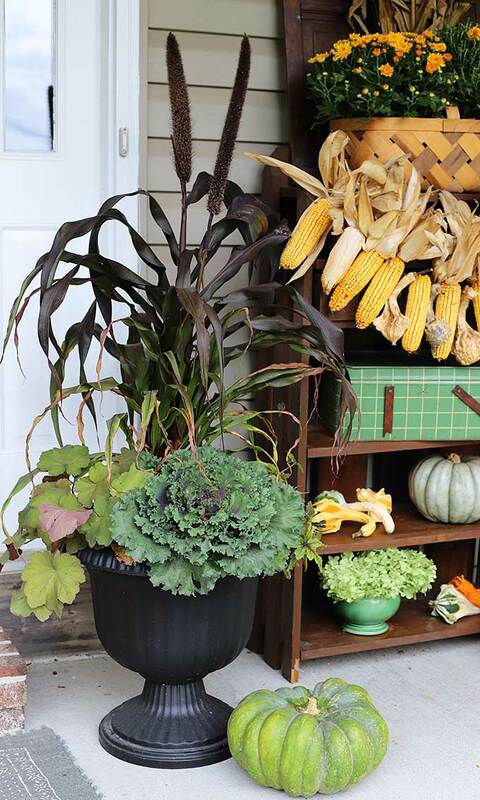 You can find it here – How To Make A Fall Corn Garland. So let’s talk about the owl here. I used this on a porch a few years ago and it’s one of those things that you either think is gaudy as heck or cool as heck. There’s no middle ground on this guy! I’m in the cool as heck group, because I obviously put him on the porch again. I sort of like those 70’s oddball pieces. OK, so let’s recap here. Raid your garage, shed and basement for fall pieces. Besides the plants, shelf and pumpkins, all these items were from my house. Use items in unexpected ways. 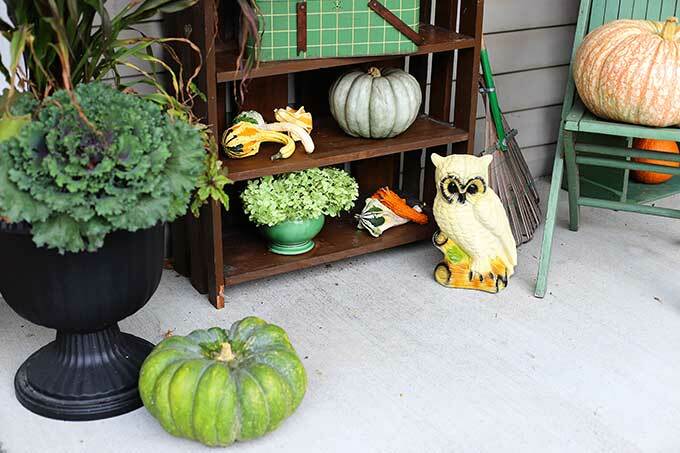 I’m sure the owl was not made to be porch decor. Who knows though since the 70’s were wild times! 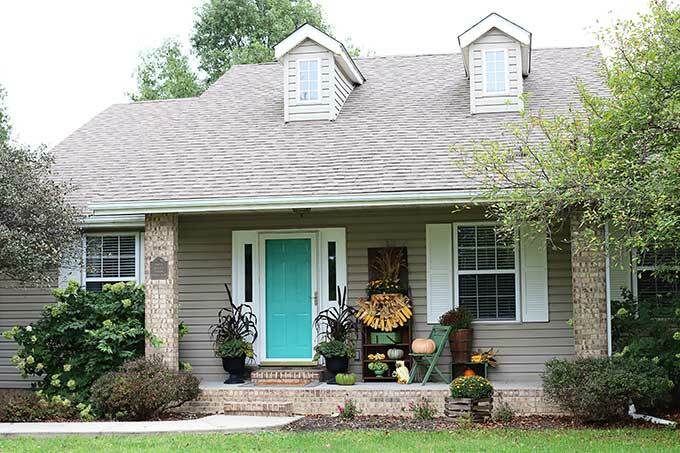 Use colorful fall foliage plants and mums for boosts of accent color. Using a variety of pumpkin colors for an eclectic fall color scheme. Trader Joe’s or your local grocery store should have a nice selection of colorful ones. Scavenge around in your yard for flowers and plants to add to your decor. Those hydrangea blooms were still on the bush ten minutes before taking these photos. Use natural materials in your decor. 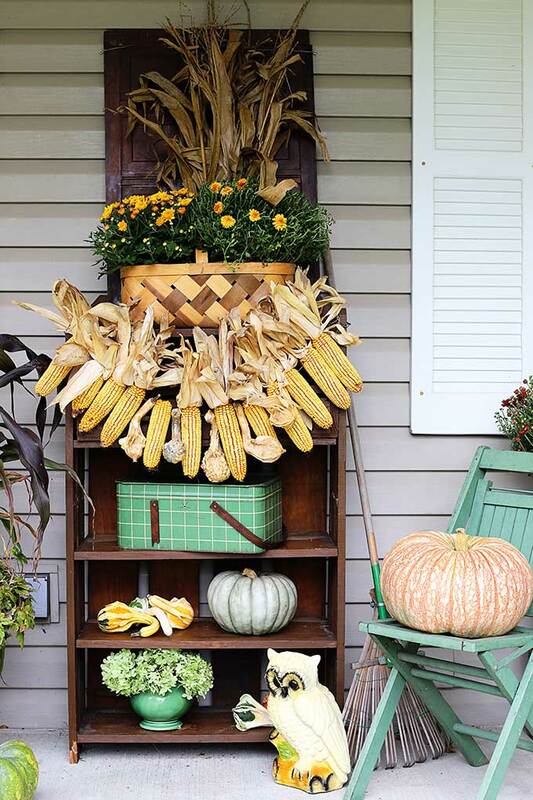 Cornstalks, corn cobs on a rope and wooden baskets are all fair game for fall decor. 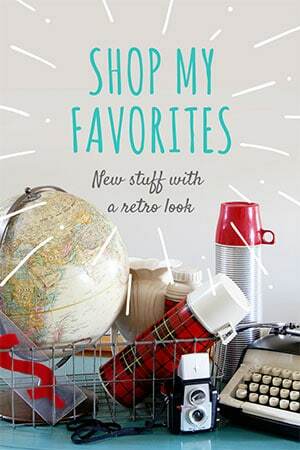 Tip – Thrift stores are great places to find CHEAP baskets and crates. Have fun while decorating your porch. I know I did. Well, except when I was cleaning chicken poo off the shelf. Love the porch and absolutely LOVE the owl! Very festive! I think your porch is great. All of the items blend so well together. I love your owl and would buy one if I ever am lucky enough to find it. WOW girl, What amazing curb appeal. The color really catches your eye. Gorgeous Pam! Well worth the wait! Love the combination of colors you have chosen! HAPPY FALL! I love everything about this! I am a farmers daughter and would LOVE to have some corn to decorate with. Although….. do you have a problem with mice? It might now be a good idea for here now that I think about it… hahahaha But I am in love with your ideas and will use it to inspire me. I’m joining you in the “cool as heck” group. I have a thing for owls, gaudy or not. so cute! great porch! Love it all and that owl is definitely a favorite. 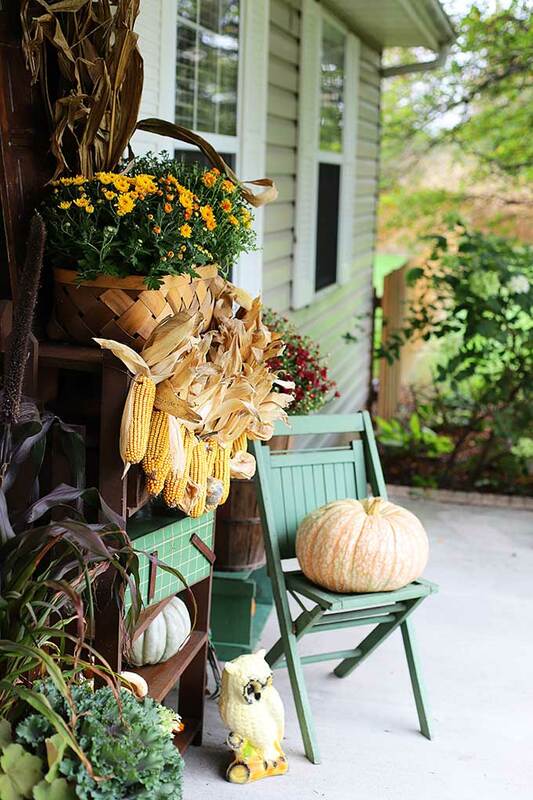 This porch decor can last well into Thanksgiving! Nicely done, Pam. Chicken poo and all!! 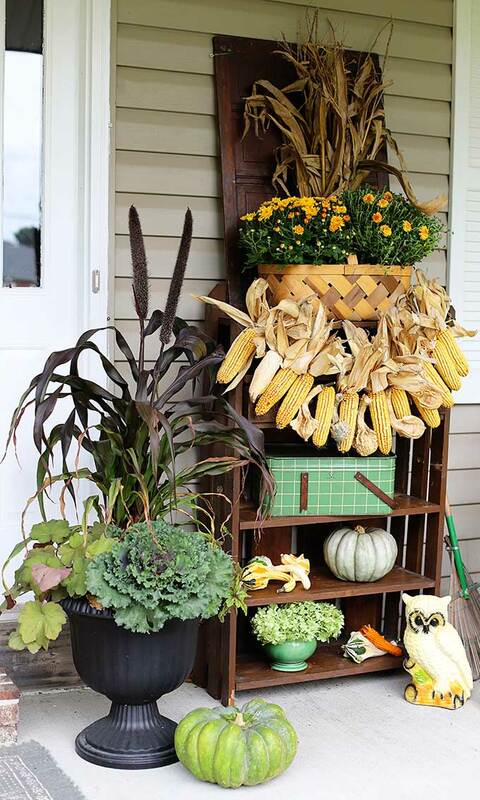 Pam, I love your fall porch decor! 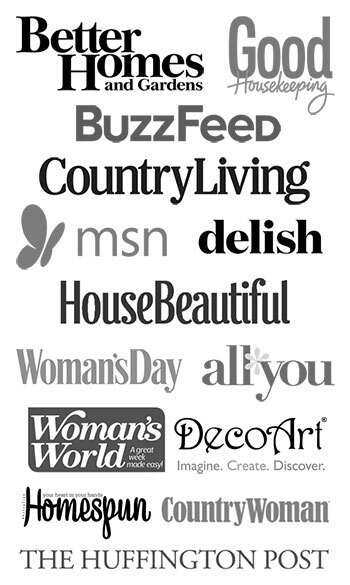 And as always, your post makes me yearn to drive to OH to go barn sale/thrift shopping!! You & your vintage goodies always speak my love language! 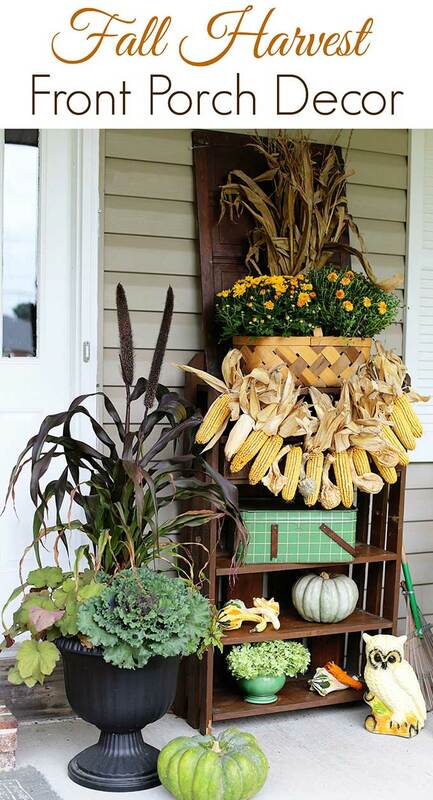 I love your front door and the corn garland. Great curb appeal. Looks great – I especially love the color of the green items! Speaking of “fall throwing up on your porch” – that would be my neighbor. I love clutter, absolutely, but I actually shuddered when I drove by her porch. This looks SO charming! Love the corn ‘garland’, Pam! Pinning! I love this, Pam! You have such a good eye. I especially like the fact that it’s not orange-heavy. That makes it much more distinctive. It goes so well with your gorgeous door. Pam, your porch is so pretty. I love the vintage touches and that corn garland is so creative! Very nice! I love all the green, it’s different. I love this SO much, Pam! The colors are fresh, unexpected, and oh-so-lovely! Love, love, love the corn garland! Beautiful job and not over the top at all I decided to go on the cheap this year, too. I love your fall decor! So, I”m feeling like an idiot with fall decorating. I want corn stalks on the sides of my front door but how do I attach them? I’ve looked at so many photos online…yours included. Are they leaning? I get if there’s a post to attach them to but I want mine in front of the side panels. Help! Lovin your porch! That Indian corn garland is too cool! Sharing! Thank you for sharing on Merry Monday! Hope to see ya next week!